When people see me, they see something they haven’t seen before, my other side. In reality, I see myself as a someone good like in my shadow box. I put some pictures up that represent me. One of them is the Seattle Seahawks. I’m not from there, but I love how they play football and football is one of my favorite sports I play. A dominant narrative is that all Latinos play soccer, but I love to play football too. I also enjoy my family culture. My mother comes from a beautiful town in Guatemala and my father is from Mexico. Our culture is really religious and I love learning about religion. How my family really cares for me and they want me to be better and not be a kid who is out in the street not respecting. After high school I want to go to college and after college I want to be in the NFL. Jildardo’s True Identity by Jil is licensed under a Creative Commons Attribution-ShareAlike 4.0 International License. 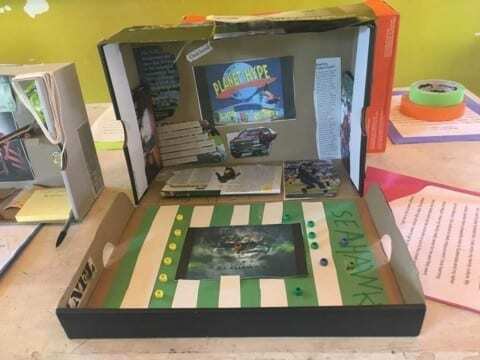 I am really impressed by your shadow box, “Jildardo’s True Identity” because I knew how you act and I always knew that you liked football but I never really knew you wanted to be in the NFL. Also, the part where you wrote about how you want to go to college and you have goals for yourself in the future really impressed me because it reminded me that I should always have goals for myself. One sentence you wrote that stands out to me is: “A dominant narrative is that all Latinos play soccer, but I love to play football too.” I think this is very important for people know because there are always people who are going to assume by the way you look or the way to seem to them. Thanks for your writing. I look forward to seeing what you write next, because I would like to see what your thoughts are on about all the issues going on. You seem like you have so many ideas and I would like to read them. I am stand out about how you care about your family and your religion and culture in your artist statement of your project, “Jildardo’s True Identity” because you were thoughtful and metacognitively of adding your family in your shadow box. Also, you added your love of football and how you want to be a football player in college. Another part is how you like the Seattle Seahawks, which are the Oakland Raiders rival and enemy in the season. Thank you for your work of art. I look forward to seeing what you make next, because I would like to see other works of art that are thoughtful and significant. Thank you for sharing your work. My name is Paola and I am a freshman student at Fremont High School. Something I liked about your work was that you put a picture of the seahawks and that shows that you love football and that is the team you go for. Something I have a question about is since when did you want to become a football player? Also, what college do you want to go to? Please feel free to comment on my work in the future. The address of my student blog is https://paolaafhs2022.edublogs.org/wp-admin/profile.php . 1.How did it feel to put what you like into a shadow box and share it with the entire world? 2.When and why do you like the Seattle Seahawks? 3.Was there something you wanted to put into the shadow box that you couldn’t find the room for? Hey there Jordan nice that you replied back. Well, to answer your question. It felt good to do my shadow box because I never expressed myself to people I have not seen and I have ADHD and it´s hard for me because it makes me space out on what I´m saying when I´m nervous. When I shared at the Peralta House I was able to stay focused and do a good job. I started liking the Seahawks when I saw the beastmode in action and how Wilson threw the ball and Baldwin when he took off. I also like them because they play good games they got Richard and he makes good plays and they´re not cocky. In addition, I wanted to put my dreams of owning a Rolls Royce and a Maserati and a big house and about music too. But I ran out of room. Music is another thing I like. Thanks for commenting and if you got dreams you can achieve them too. If you did a Shadow Box what would you put in it?